How are digital solutions changing consumer expectations and the buying journey in skincare? The impact of new digital solutions can be seen and felt throughout the entirety of the skincare, cosmetic and beauty categories, impacting how consumers research their own needs, evaluate and select products, how and where they buy, and how they evaluate their own effectiveness. The influx of digital solutions into skincare corresponds to changing consumer expectations: effectiveness is now the primary benefit sought by consumers, overriding other trends. Digital innovations – with a new emphasis on personalization and effectiveness – are positioned to deliver on these evolving consumer needs. Digital technologies are shifting the ecosystem and market norms, providing new opportunities to prove product effectiveness, engage with influencers, and create new brand experiences. The changes in the consumer journey have been accompanied by a proliferation of new entrants and traditional businesses exploring new business models that will continue to change and revolutionize how we evaluate, purchase products and points of contact driving brand engagement. We introduce the four major areas where digital is impacting the consumer journey. 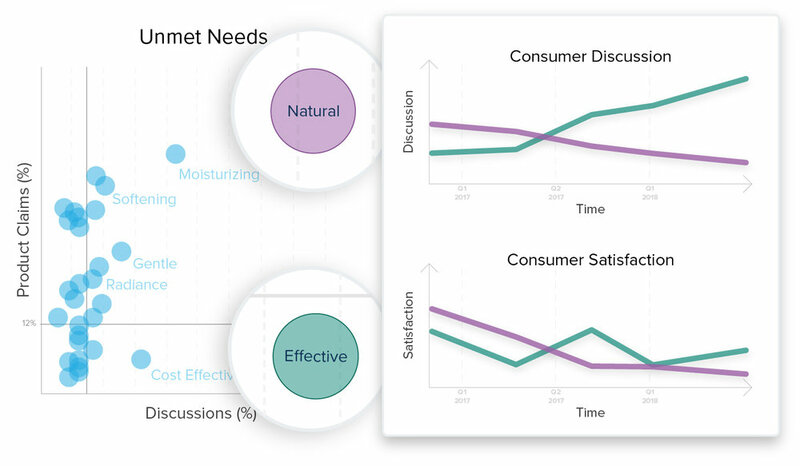 “The White Space Identification analysis reveals “effective” as an unmet consumer need: since early 2017, “effective” is the primary benefit trending in consumer discussions and associated with consumer satisfaction. This creates the right conditions for an influx and success of digital solutions, with their increased focus on proving and monitoring product effectiveness. Digital advances are ushering in a new era of personalization to aid consumers in finding and selecting the right product. Merely walking into a Sephora store presents a consumer with thousands of options. In an oversaturated product landscape, difficult to navigate with many products sharing similar claims, retailers and brands alike are developing new solutions that help consumers narrow down and select the right products for skin condition or desired benefit. These applications also present new opportunities to dovetail and augment the in-store experience. Bare Minerals (owned by Shiseido) acquired MatchCo technology in January 2018 in part to enhance their MADE-2- FIT app. MADE-2-FIT scans the user’s skin in several locations and uses the data collected to individually blend a perfectly matching custom foundation for each consumer. Products can be shipped directly to consumers, or formulated in Bare Minerals storefront locations. 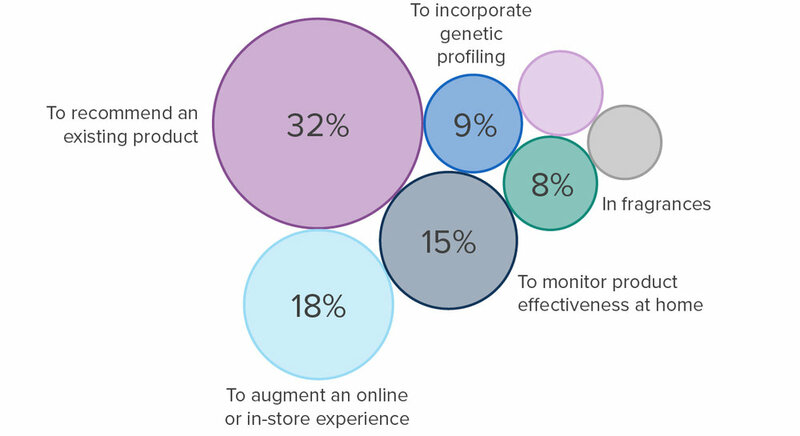 New applications and in-store evaluation experiences are also empowering consumers to explore new purchasing motions that allow them to buy skincare products in new ways. In addition to new innovations we profiled above that drive new purchasing motions, such as Lesielle and MatchCo, cosmetic brands are working to incorporate new virtual assistants and e-commerce models into their core business operations. 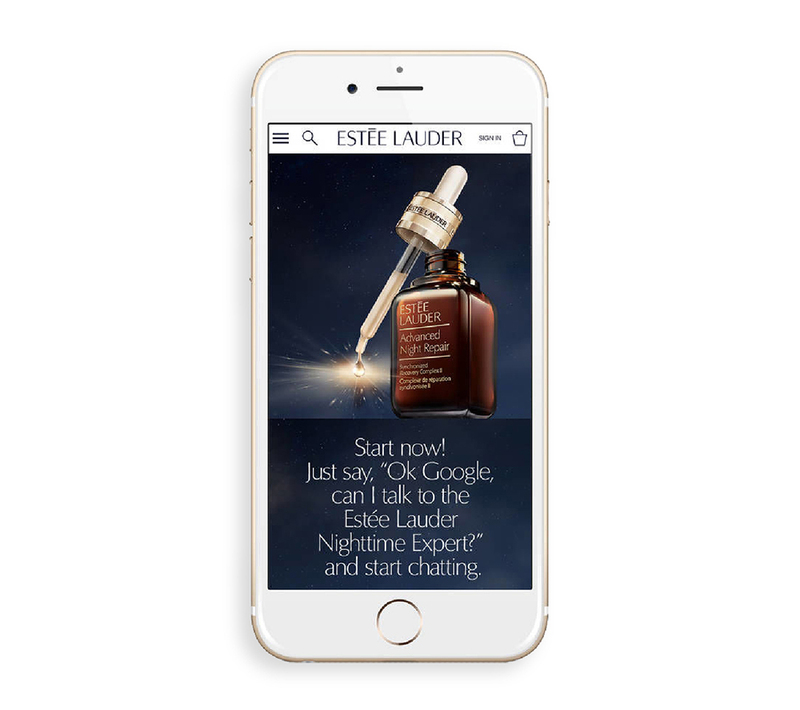 is called the “Estée Lauder Nighttime Expert” which offers consumers personalized nighttime skincare routines by leading them through a pathway of of questions and answers about skin health. In addition to providing customers with treatment and application guidelines, the application directly links users to additional products for purchase. per the product claims? New solutions are being developed and released that monitor your skincare process, and are designed to show you that anti-aging benefits, radiance, and others actually work. This places a new spotlight on an industry where the traditional “path-to-purchase” has been heavily driven by brand perception, brand loyalty and heavy-hitting product claims. New solutions designed to show and prove efficacy will have a huge impact on the product experience and brand loyalty side of the business. What’s more, influencers have already picked this up, and are focusing on discussing and proving efficacy. False claims will no longer be valid – providing consumer-facing evidence why they should repurchase will be critical to driving brand loyalty. ModiFace was developed as a white- label solution designed to bring digital innovation to the big beauty brands, with a focus on bringing augmented reality technological capabilities into skincare. In March 2018, L’Oréal acquired Modiface. The core product offerings provide the ability to perform beauty try-on simulations on live video, and to track the face and facial features in precise detail: the platform guides users through a virtual skin consultation, after which the most appropriate products are suggested. Prior to its acquisition, the technology had been in testing with L’Oréal Vichy skincare brand, and MAC Cosmetics has used the technology to create an augmented reality “try-on” mirror; which allows customers to try on new shades using live, in-store video. While it still remains to be seen whether L’Oréal will use this technology internally or continue to develop and license it as a service to other brands, the acquisition is a game-changing bet on digital and personalized products. It also opens a Augmented Reality as a new line of business for L’Oréal, competing against other AR sales platforms such as YouCam. Digital solutions are reshaping skincare product forms as they impact core products and product extensions. We see many examples of digital solutions and devices being incorporated to address specific conditions, or enhance the effectiveness of a more traditional product form, such as a cream or a serum. Nu Skin launched ageLOC LumiSpa, developed by board certified dermatologists, a new cleansing device that focuses on cleaning away oil, dirt, makeup and toxins. 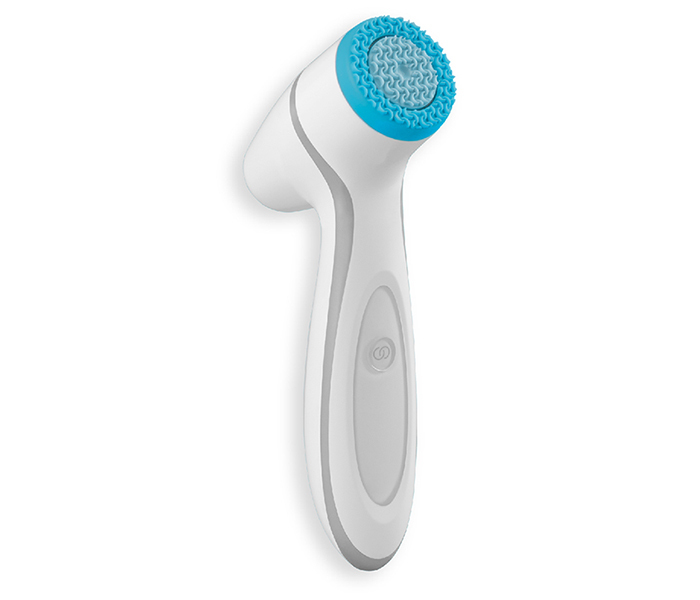 The device claims to optimize product efficiency via making skin more receptive to the products applied to it. The device contains four treatment modes suitable for different skin forms - dry, normal, oily and sensitive. Lesielle’s innovative new patented device offers consumers the chance to make personalized cosmetics at home. The company, which claims to change the cosmetics industry as we know it, would allow consumers the ability to affordably diagnose and formulate custom cosmetics at-home. After doing an at-home diagnosis, the consumer is guided to select how to create and customize her own cosmetics; consumers select their desired benefits, features, and textures, and the product is blended at home. The device, which is thus far still unreleased, is surprisingly affordable, with price points set to start at €30. How should skincare leaders respond? In light of all the changes in the skincare ecosystem, innovators and brands need a system of insight that allows them to understand, anticipate, and act with greater clarity and confidence. Skincare and beauty categories exemplify the power of direct-to-consumer emergences, the ubiquity of connected devices, and the adoption of digital as the new center of gravity in offering consumers unparalleled access, choice and buying power. Decision-makers working throughout skincare are challenged to understand the connection between technological and consumer-driven disruption drivers. The white paper 'Digital Disruption in the Skincare Ecosystem' continues this discussion, and spotlights the top ten skincare products exemplifying digital disruption. To learn more about how the Signals Playbook™ empowers skincare and beauty brands to anticipate trends, respond to “shift on the fly” consumer needs and drive richer, more lasting omnichannel experiences, check out the full white paper.